This Strawberry Frosting is just bursting with fruity flavor layered between perfectly moist layers of pink champagne cake! I just love the surprise addition of strawberry in between the layers. Plus, this cake is covered in a bubbly, sweet champagne frosting. You’ll definitely want to make this delicious strawberry champagne cake for more holidays than just Valentine’s Day! This cake is seriously so amazing and has two types of frosting to give it the perfect sweetness! For the champagne frosting, beat butter with your shortening until smooth. Next, you’ll want to slowly add in half of your powdered sugar, champagne, and the other half of powdered sugar (mixing in between each ingredient). Lastly, you’ll want to add in the remaining cooked champagne from the cake batter. This step is important in getting the right consistency, so if you run out of champagne, use water or milk to thin out the frosting! For this cake recipe, one of the most important steps is to cook down the whole bottle of champagne until you are only left with one cup (make sure not to boil), and then refrigerate until all the way cool. Next, you’ll want to cream the butter and sugar together (you want it to be light in color and fluffy) then add sour cream and vanilla until combined. You’ll want to add egg whites in two batches, making sure it is all well combined. When you combine the dry ingredients in a separate bowl you’ll also combine the milk and ¾ cup of the cooked champagne to a measuring cup (the other ¼ of champagne is saved for the frosting). Then add half the dry ingredients to your batter along with the champagne mixture, mix and add the other half of the dry ingredients. Finally, divide the batter evenly between pans and bake for 23-27 minutes at 350 degrees. I seriously cannot get enough of this champagne cake and wish I had a piece sitting on my desk as I type this! Get ready to wow your friends and family at your next special occasion with this perfect cake. I would love to see how you all are decorating your desserts for Valentine’s Day or other upcoming events! 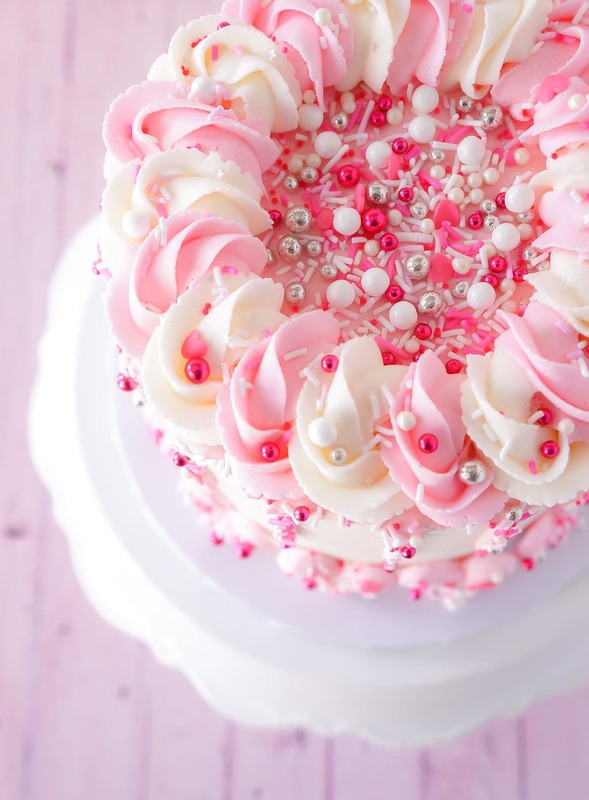 Let me know in the comments if you have any more ideas for pink and sprinkled desserts. ;) Have a happy happy Valentine’s Day! Add all of the champagne to a medium sized saucepan and cook over medium heat until 1 cup remains. Don’t let it boil. To measure how much champagne remains, pour into a glass measuring cup. Add it back to the pan if it needs longer to cook down. When done, refrigerate until cool. Grease three 8-inch cake pans and line the bottoms with parchment paper. Preheat your oven to 350°F. In a large mixing bowl, cream the butter and sugar until light and fluffy, about 3-4 minutes. Add egg whites in two batches, mixing until well combined after each. Scrape down the sides of the bowl as needed to be sure all ingredients are incorporated. Combine dry ingredients in a separate bowl, then combine the milk and 3/4 cup of the cooked and cooled champagne. Add half of the dry ingredients to the batter and mix until well combined. Add the champagne mixture and mix until well combined. Add remaining dry ingredients and mix until well combined. Scrape down the sides of the bowl as needed to be sure all ingredients are incorporated. Divide the batter evenly between the cakes pans and bake for about 23-27 minutes, or until a toothpick comes out with a few crumbs. Remove the cakes from the oven and allow to cool for a few minutes, then remove to cooling racks to cool completely. To make the strawberry frosting, puree the strawberries in a food processor. Strain the puree through a fine mesh sieve to remove the seeds. Slowly add half of the powdered sugar and mix until smooth. Add 3-4 tablespoons of strawberry puree and mix until smooth. Slowly add the remaining powdered sugar and mix until smooth. Add additional strawberry puree, as needed, to get the right consistency. Set aside. To make the champagne frosting, beat the butter and shortening together until smooth. Add 3 tablespoons of champagne and mix until smooth. Slowly add remaining powdered sugar and mix until smooth. Add remaining cooked down champagne (from the cake), as needed. If you run out of champagne and the frosting is still too thick, add a touch of water or milk. 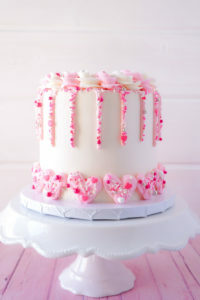 To put the cake together, use a large serrated knife to remove the domes from the top of the cakes so that they’re flat. Place the first cake on a serving plate or a cardboard cake round. Set aside about 1/2 cup of strawberry frosting, then spread about half of the remaining strawberry frosting evenly on top of the cake layer. Add the second layer of cake and another cup of strawberry frosting. Top the cake with the remaining layer and frost the cake with the champagne frosting. 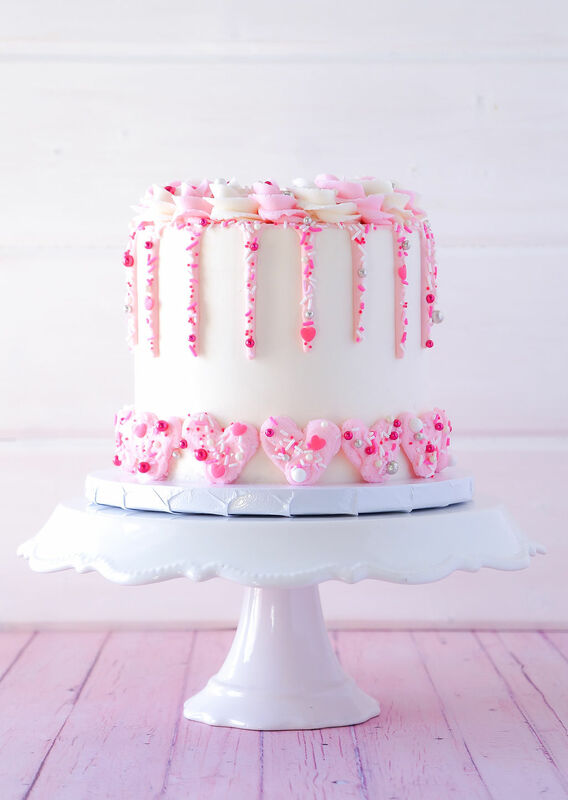 Use a Wilton 2A tip to pipe little pink hearts onto parchment paper and add sprinkles if you’d like. Freeze the hearts so you can easily handle them. 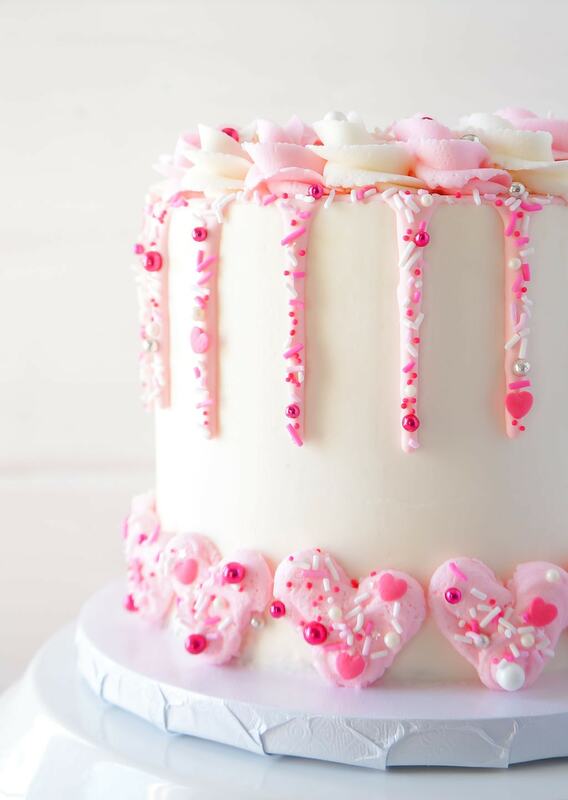 Attach the hearts to the cake with a dab of buttercream. 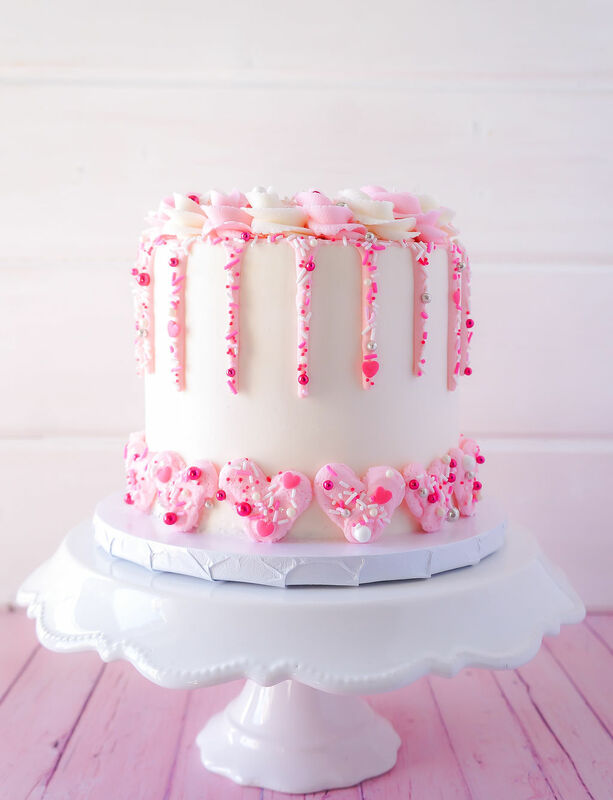 Use a 3:1 white chocolate to heavy cream ratio with a touch of Wilton White-White icing color and “Soft Pink” by Americolor in order to create the drip effect. To place the sprinkles, use a combination of your fingers and food tweezers. Use a Wilton 1M tip for the border and finish off with more sprinkles.